When it comes to bedtime there are plenty of places that cats love to sleep, these usually come in the form of places that they shouldn’t. Including your bed, your sofa and on top of your clean clothes. But how can you tempt your feline friend away from these places and onto their very own sleeping place? We have put together some of the very best cat beds out there to see if any of them have exactly what your kitty is looking for? What if you could combine a cat scratcher with a comfy cat bed? This item is just that. 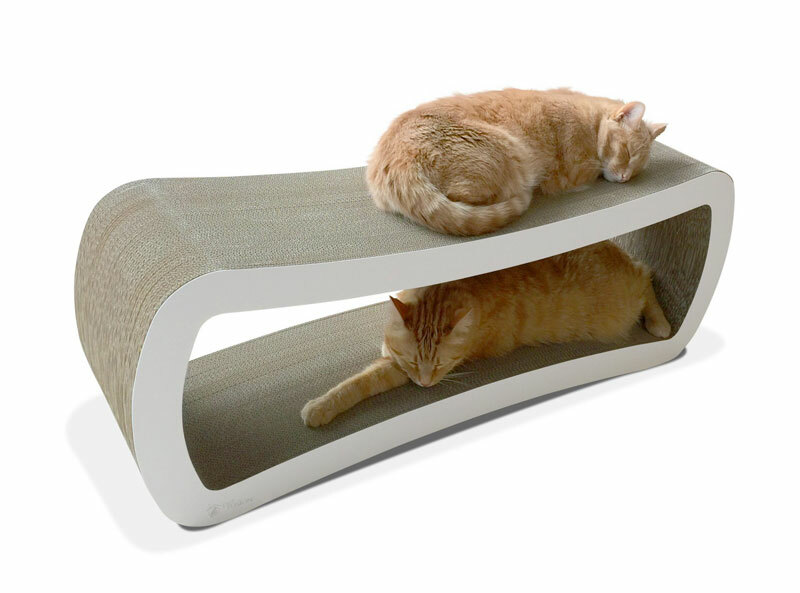 Made to accommodate up to 4 adult cats at a time, this bed and scratcher combination features a curved design which is not only more comfortable for your cat to lounge on but is easier for them to scratch too. It comes with dense cardboard which means that it will last longer than other scratchers and is available in different colours so that it will fit in with the theme of your home. Okay so we know this one is down as a puppy bed, but you might be pleased to know that it is perfect for cats too. What we really love about this crazy pet bed is that it is lots of fun. More than just a place for your kitty to snuggle down in, it also makes a great focal point for your home too! Cats love having a warm and snuggly place to sleep; this is why you will often find them on your piles of washing or led in the sunshine out in the garden. That is why the Radiator Cat Bed has fast become a popular cat bed for owners around the world. These simple fleecy beds are made to hang from your radiator and offers your kitty a sturdy place to sleep. Similar to the Radiator Cat Bed, this Window Hammock is designed for your kitty to relax in the sunshine. Easy to attach to the window using the heavy duty suction pads; this hammock can take more than one cat, meaning that when the sun is shining there is a good chance you might find your whole clan relaxing in the rays. The Igloo design cat bed is popular because it offers your cat a place to hide away when they want to sleep in peace. This particular cat bed comes with a fleecy interior and is made from quality faux suede meaning that it not only looks great but also stays nice and clean too. We all love our cats and one of the best ways to show them just how we feel is to give them a nice, comfortable place to sleep. So why not pick up a nice new bed for your kitty to curl up on? Let us know in the comments below if we missed something out or what your favourite cat bed is? This entry was posted in Cats, Style and tagged beds.